The EUR/RON delivered more of the same yesterday, with above average turnover, another historical high fixing and an overall upward trend. The pair closed around 4.69 and a test of 4.70 now looks to be in sight. It remains to be seen if, at this level, we will have the first “line in the sand” from the central bank, which so far has only smoothed the Romanian leu's weakening trend. For now, we tend to believe that some consolidation at higher levels could occur after the move seen since the beginning of the year. Mixed trading in ROMGBs yesterday which resulted in an overall bull flattening of the curve though liquidity remains choppy and intraday volatility quite high. Primary market auctions failed to lift spirits as outcomes have been weak at best. The RON500 million 1Y T-bills auction was rejected on total demand of RON209 million at an average of 3.59%. This auction was more relevant for local demand, which obviously is not looking too strong at the moment. The February 2029 for RON400 million, on the other hand, came out a bit better at least demand-wise, considering the recent pattern. The Ministry of Finance allocated RON389 million from a total demand of RON593 million. Yield-wise however it came in above expectations at a 5.11% average and 5.17% maximum, a rather unusual long tail, likely reflecting an increased degree of uncertainty being priced in. 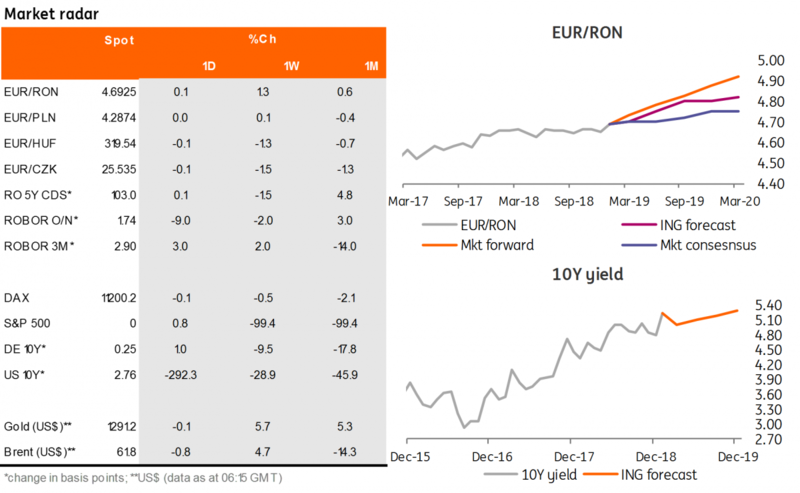 With overnight rates stable at the deposit facility, the upside move in the EUR/RON triggered some paying interest along the FX swap curve yesterday. Implied yields above 1M are again trading above the 3.50% Lombard rate, though the 1M to 1Y curve remains rather flat.